In July of 2012, I was on top of the world! 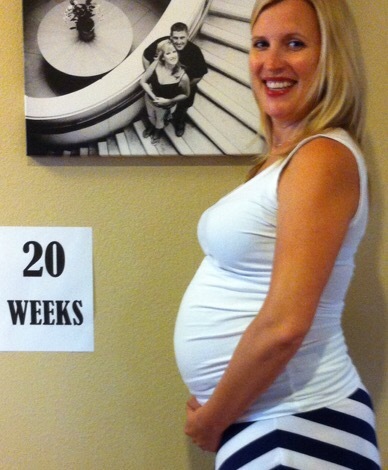 After fighting infertility for years, my husband, Bryan and I were finally pregnant! We were expecting 2 amazing baby boys who were due late November. My pregnancy had been nothing short of amazing and we were off to meet my new nephew and visit my hometown for a baby shower. That’s when our lives were changed forever. Once I arrived, the doctors were successful in stabilizing me and preventing such early delivery. As 24 weeks is considered the limit of viability, I knew this was critical and I settled in for what I prayed would be a long, uneventful stay. Bryan returned to our home in California, 2200 miles away, to work and we began to count each day as a prize. 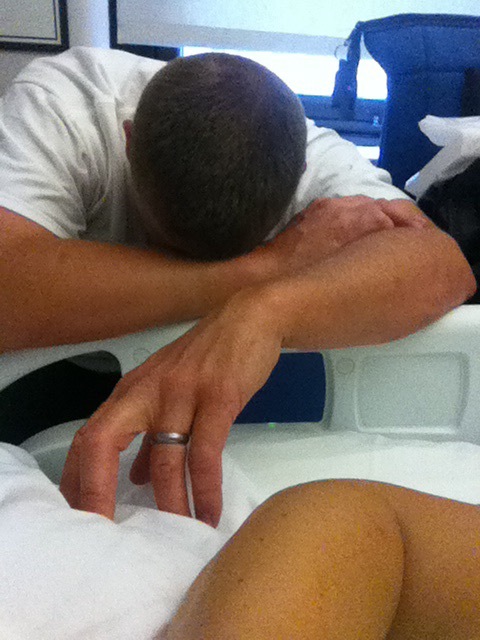 After nearly 2 weeks on strict bed rest in the hospital, labor began. The doctors did all they could to prevent it, but they just couldn’t hold it off any longer. I called Bryan at 3 o’clock in the morning and told him to get on the soonest possible flight back to Illinois. Since our boys were fraternal twins, my doctor decided to try to deliver only one baby and keep the other inside as long as possible. At only 23 weeks and 4 days gestation, my sweet little Logan was born. The Neonatologist told us all about the risks and challenges that face a child born so early. We knew we just had to give our tiny baby a chance. 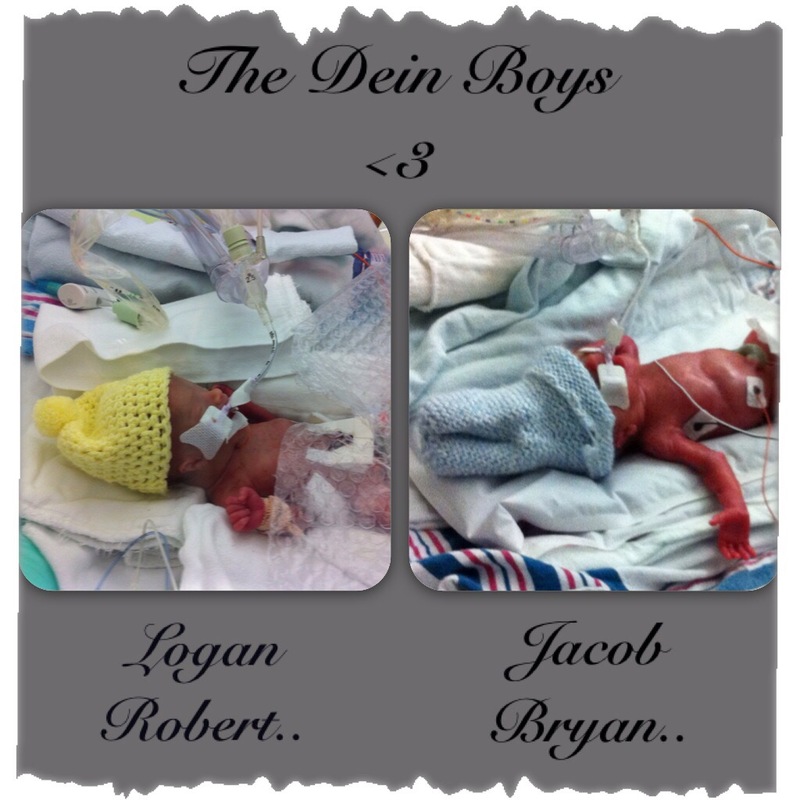 After Logan was born, he gave my finger a tight squeeze to show me his strength and was whisked off to the NICU. That evening, Bryan arrived and spent the next 48 hours making constant runs between the NICU and Labor and Delivery units to bring updates. Two very valuable days later, Jacob decided it was time to join us and was born via emergency Cesarean. He was the size of an ear of corn and weighed only 1lb 12 ounces. Once both boys made it through their first 24 hours, we prayed we were in the clear. We settled into our routine and spent every minute with them that we could. When I was discharged from the hospital, we stayed with my parents and made the hour commute each and every day. Each day was a strange mix of hope, fear, desperation and courage. We learned the routines of the hospital, the rotations of the doctors and nurses, and feeling of our hearts stopping any time the phone rang at 2am. On the morning of August 11, we got a call that Logan was struggling. The doctors and nurses did all they could to stabilize him, but he wasn’t breathing properly. The hour drive to the hospital felt like an eternity as Bryan used all his strength to fight the urge to drive at light speed. We made it just in time to hold our sweet baby for the first and last time. The next day, Jacob’s fight began. 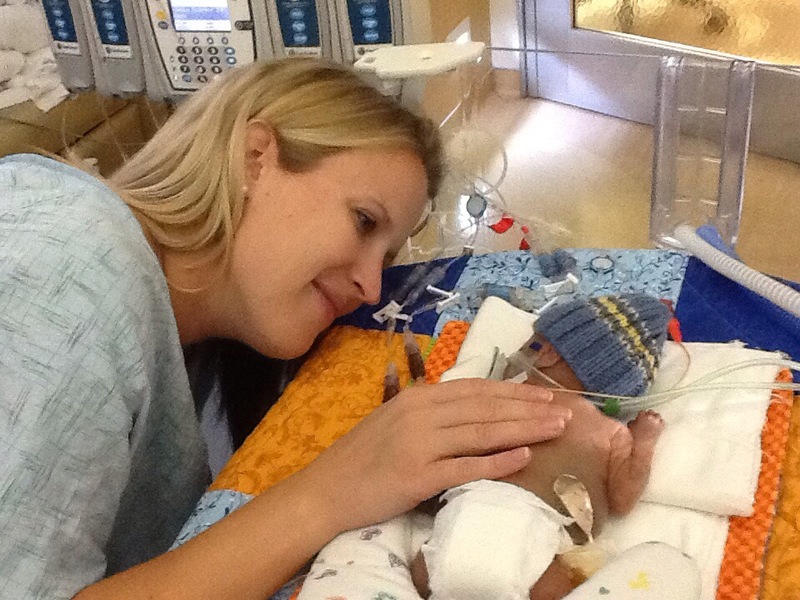 With his new guardian angel at his side, Jacob endured his first emergency surgery. 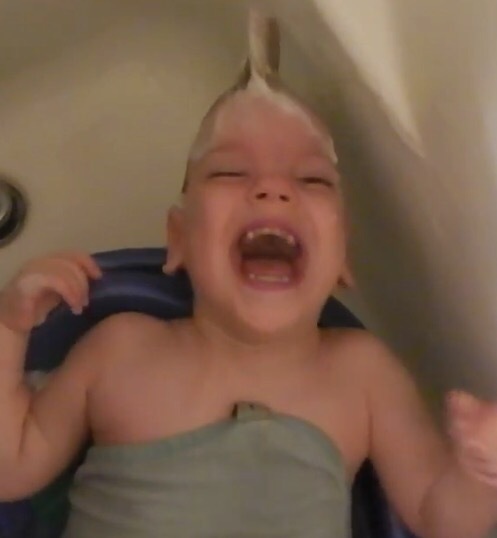 He would have 8 more by the time he was 6 months old. He showed us that he has strength and determination to handle anything. We also learned about our own strength, our ability to absorb a crash course in neonatology, and immense value of family and faith. We were all stretched beyond our limits and taught lessons we never could’ve imagined in those first 4 months. After 144 days in 3 different NICU’s, we got to bring our amazing little boy home! When Jacob was 10 months old we made our first trip to Philadelphia to visit The Institutes for the Achievement of Human Potential. The specialists there have been helping children recover from brain injury for 60 years. We have returned every 6 months to be evaluated and have a home program developed just for him. 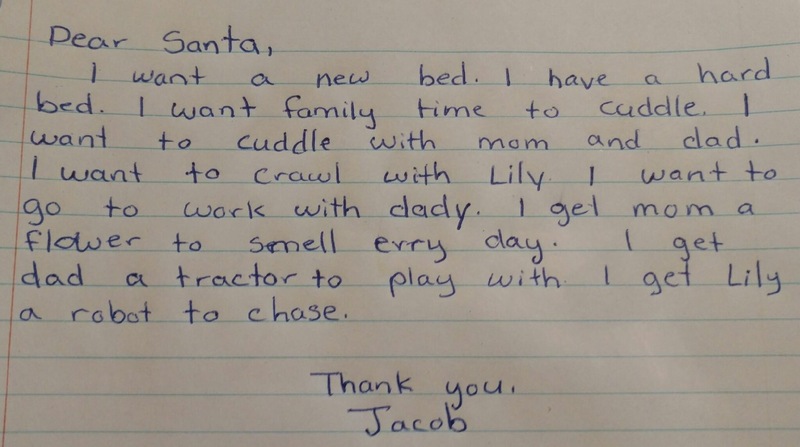 We commit every day to giving Jacob his very best chance. Because of this program, while he was once blind, he can now see! He was once deaf and he can now hear!! Jacob is much healthier, can read independently, and has made incredible gains. We have learned invaluable lessons about nutrition, intelligence and respiration. Most importantly, we have learned to always believe in and respect our incredible son. We have been given many diagnoses for Jacob. He suffered from cortical blindness, profound hearing loss, developmental delay and Cerebral Palsy. 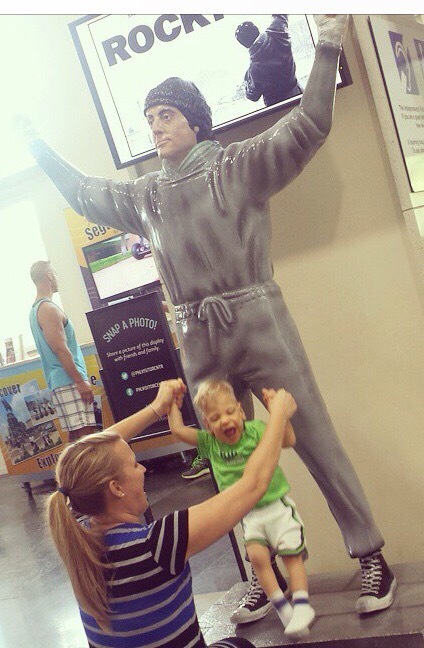 He was also given the gift of incredible joy and insurmountable determination. He has parents, friends, family and specialists that are behind him 100%! 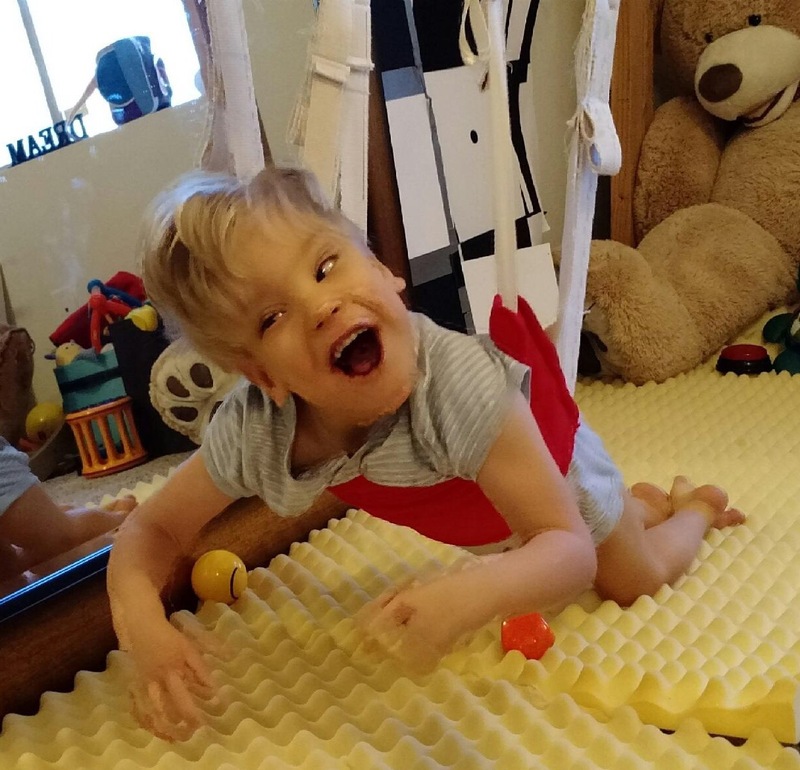 Now, Jacob’s greatest obstacle is his mobility. He wants so badly to crawl and walk and run. He has the strength, but lacks the coordination. We have researched many therapies that have proven to help children just like Jacob. The challenge we now face is accessing these therapies for him as they are not covered by insurance and are paid completely out of pocket. There is no gold standard of care for children with cerebral palsy. But, that does not mean that there are not techniques that can help these children immensely. Through our research we have found the following therapies that we believe can help Jacob overcome his physical obstacles. Step 3: MNRI and CME – to provide input and information to the new cells and build the structure upon that foundation! We believe in our little boy and we will stop at nothing to help him reach his goal of running! We have completed extensive research into these therapies and have consulted with many medical professionals to determine that this combination will offer great hope and progress to our incredible Jacob. After cutting spending, depleting our savings and putting every penny towards Jacob’s therapies, we have exhausted our financial resources. We cannot do this alone. If you are able, please know that any support you can offer will help us move mountains! We know that this “wish list” for Jacob will require substantial fundraising, but we have faith that, with your help, WE CAN DO IT!! There are 2 great options for donations. The first is to our new friends at The Bridge to Healing 501(c)3. A donation here is fully tax deductible and 75% of your donation will go into Jacob’s account and will be used for his therapies. The rest will go into the general fund to help the organization match donations for other children like they did for the first $1000 we contributed for Jacob. The second option is to make a direct donation through our GoFundMe page or send a check. I will send all donations directly to The Bridge to Healing AND have the donation matched by my company! This means a $100 donation turns into $150 for Jacob’s account! We are so grateful for all the love and support we have received along this journey. I look forward to sharing updates on the incredible progress our little fighter will make! We’ve been told from the beginning that this is a a marathon, not a sprint. We believe in him and we believe in you. Thank you all and Go Team Jacob!! Stem Cell Treatment – Mesenchymal stem cells from umbilical cord blood are considered to be universal donor cells because they are not immediately recognized as foreign. The cells home to damaged tissue and are known to secrete molecules called trophic factors. Trophic factors from mesenchymal stem cells are known to stimulate repair of damaged nervous tissue in both the brain and the spinal cord. Some of these are neurotrophic factors that promote neuronal growth, induce new blood vessel growth, neurogenesis and astroglial activation, encourage synaptic connection and axonal remyelination, decrease programed cell death, and regulate microglial activation. Evidence shows that this treatment can make significant impact by targeting specific areas of injury and can impact vision, spasticity and mobility. This treatment is an infusion of stem cells from umbilical cord blood donated from a healthy pregnancy. These are NOT embryonic stem cells and this treatment is very low risk. This is the most promising development in the treatment for Cerebral Palsy and is our best shot to heal the damage to Jacob’s brain. HBOT – Hyperbaric Oxygen Treatment has shown reproducible benefits for more than 2 decades in hundreds of children with CP around the world. It works by regenerating or reviving cells in the ischemic penumbra in the brain. This increased vascular activity allows the reactivation of “idling ” neurons that are a result of injuries such as brain bleeds. This therapy will help all of Jacob’s other therapies be more effective. MNRI – Masgutova Neurosensory Reflex Integration. This therapy identifies the reflexes that are not working properly and, through specific exercises, corrects the abnormality. Through this, Jacob will have improved perception of his body and where it is in space, and will gain use of his body in the proper manner. CME – Cuevas Medek Exercises®, is a psychomotor therapy approach for infants suffering abnormal developmental motor evolution caused by a known or unknown non-degenerative syndrome affecting the Central Nervous System. This therapy can be applied to children from the age of 3 months until they achieve and control independent walking. Because the CME® certified therapy practitioner needs to expose the infant to the influence of gravity, by providing progressive distal support, the use of this therapy may be limited by the child’s size and weight. It is critical that we begin this therapy as soon as possible. The bigger Jacob gets, the more challenging this therapy becomes. Cost – $4500-$6750 biannually for 3 week intensive treatment, 2-3 hours per day.